.The St. Louis Depot Mounted Services Artillery Jacket has many of the same features that you would find on a contract-made mounted services jacket. However, this garment is not a contract-made item, but rather a government-produced item. While it has the standard six-piece body and two-piece sleeve construction seen on most mounted services jackets, it also has many features that can be considered anomalies. Most arsenals & depots used sewing machines in limited areas of production, unlike contractors who used machines where ever possible. 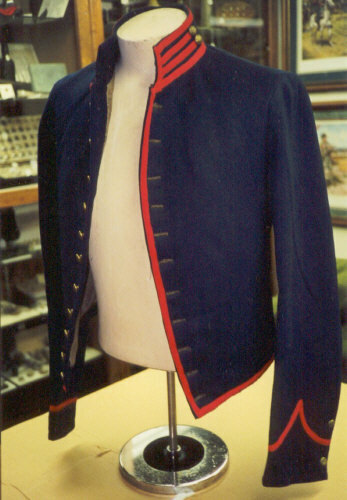 The St. Louis Depot Mounted Services Jacket has an unusual amount of machining stitching for a government-made garment. It is interesting to note that the only hand work on the whole jacket is the pocket opening, tape around the bolsters, sleeve linings at the arm holes, buttonholes and buttons. Most Mounted Services Jackets produced and issued during the Civil War had two 'false button holes' on the collar. These false button holes were formed by applying two double-rows of wool lace. 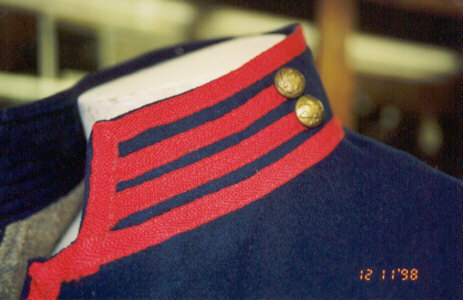 Among the unique features of the St. Louis Depot Jacket is that the collar trim only has only two single-rows of trim on each side of the collar, instead of the two-double rows. Top row of trim ends 4" from end of collar Bottom row ends 4 1/2 from end of collar. The collar height of 2" is slightly lower than the Federal Quartermaster Regulations call for 2. The rear of the collar the is 1 7/8" high. The bottom of the inner collar is raw edged and as with most uniforms, the inner collar is pieced. There is one hook and, but the eye is missing. The collar buttons are counter sunk into the collar. One obvious feature that makes this garment unique among other government-made mounted services jackets is the amount of buttons down the front. 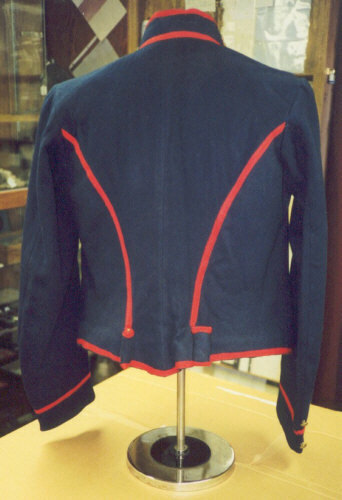 The Federal Quartermaster Regulations1 specified that the mounted services jackets were to have a twelve button front. This example from the St. Louis Depot features only eleven 3/4" key hole corded buttons holes. The top buttonhole is placed 3/4" from the top and the bottom buttonhole is set 1" from the bottom. The machine topstitching on the button side of the jacket is 1" from the edge. 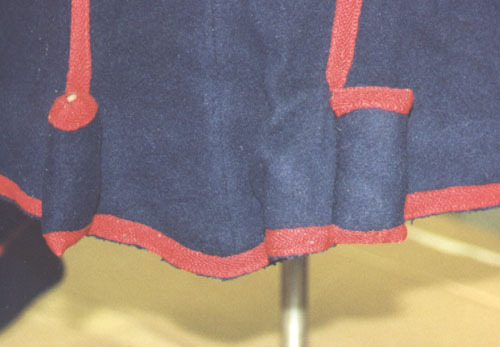 The 3/8" worsted wool scarlet tape is applied by sewing machine throughout the entire garment with the exception of the bolters, where it is sewn on by hand. 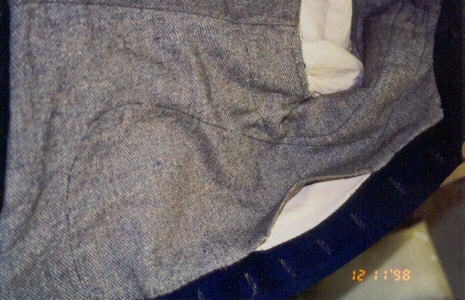 This indicates that the bolsters were set into the rear seam first, before the tape was applied. 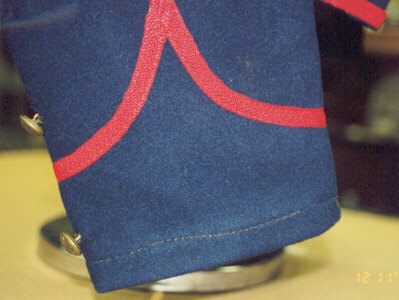 The bolsters were set at the bottom of the rear/side seams and were designed to 'bolster' the weight of an artillery sable belt which carried the pistol and sabre of a mounted soldier. The mounted services jackets are typically longer than most other Civil War shell jackets as the belt needed ride above the bolsters. The bolsters on this jacket are 5" apart. 2 1/2" high, 1 1/8" wide. While the trim on the bolsters is applied by hand, the trim on the back/side seam is applied by machine, since there is no stitching on the inside of the lining, this must have been done prior to the lining being set into the garment. The overall body measurements are 21" down the center back seam, 19 3/4" down the front and 11 1/2" down the side seam. 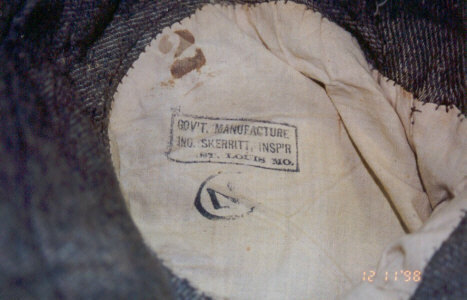 The inspector stamp on the inside of the garment is marked "GOV'T MANUFACTURE/JNO. SKERRITT, INSP'R/ST. LOUIS MO." The Inspector stamp is 1" high by 2 1/2" wide. John Skerritt worked in St. Louis at the Fourth Street Hall (also known as Hall #4) from January 8, 1863 into June 1865 The garment is marked with two other stamps, one is a size stamp is marked "2" in red ink, this is most likely the size the garment was cut to. Although marked size 2, few of the sizes of the garment match those called for by the Federal Quartermaster Regulations 2. The second "2" is likely the inspector's confirmation of the size. For the Schuylkill Arsenal that was the purpose of the dots. The dot stamp indicated the size to the cutter/issuer of the kit to the seamstress, and the numeral stamp indicated the size inspected and for later reference. Unlike other arsenal produced mounted services jackets, this jacket had a non-functional cuff, instead of the traditional two-button functional cuff. The jacket has a two-piece sleeve and the cuff is topstitched 1/2" from bottom. The chevron pattern trim is 2" high in the rear and curves up to 4 1/2" in front. Button placement from bottom of the cuff is 1 1/4" and 3 1/2". Width at the elbow of the sleeve is 7 3/4" and the width at the cuff is 5 3/8" The sleeve lining is made from a thin off white cotton material. The body lining is woven out of a jean cloth with a brownish wool yarn and off white cotton. Three rows of quilting are machine stitched in a circular pattern about 2" to 3" apart. The quilting covers the front and side panels. The inside pocket is also made out of the same thin cotton that the sleeves were cut from The pocket was in a kidney shape about 13 1/2" high, 6" deep at bottom, 1 1/4" on top. The pocket opening is about 5" and is double rolled and hand topstitched. As the quilting skirts around the pocket, it is safe to assume that the quilting was done after the pocket was set. On most artillery jackets the pocket was usually set after the quilting. 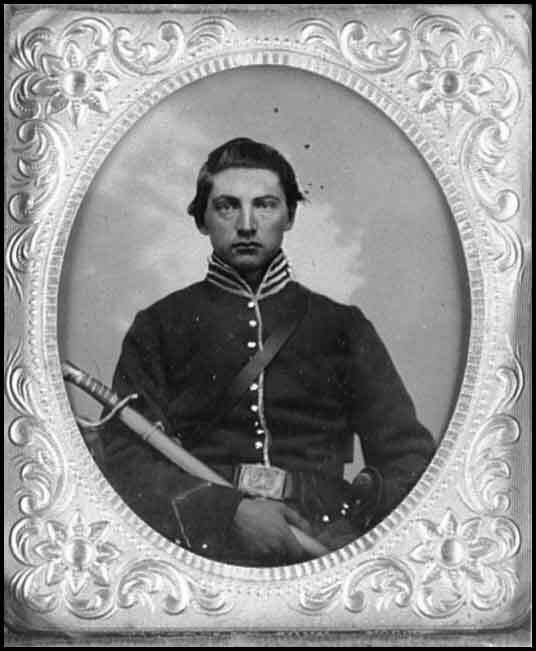 Corp. Nailer, 13th Pennsylvania Cavalry, wearing a jacket that has similar features to the St. Louis Depot Jacket. 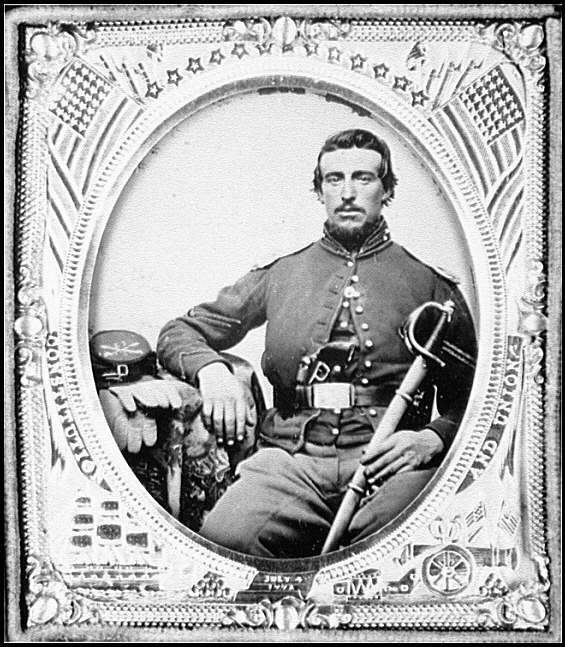 An unidentified Cavalry Trooper, also wearing a St. Louis Depot 'style' Jacket. I'd like to thank the Fred Gaede for his info on the St. Louis Depot, Inspectors John Skerritt, Contractor Joseph Lee (Lea), and the US Quartermaster Regulations on Mounted Services Jackets; and the Farnsworth House for allowing me to document this garment. Tibbals, Richard K., Military Collector and Historian, A variant Government-Made Artillery Jacket, Vol. XXXIV, (Spring 1982), pp33-34, Washington D.C.
1. Jacket for light artillery or cavalry: 1 1/4 yards of 6-4 dark blue cloth; 1 yard of 7/8 lining; 1 yard of 4-4 unbleached muslin; 3/4 of a yard of 24 inch canvas; 1 sheet of black cotton wadding; I inch of brown holland; 20 vest buttons; 1 hook and eye, black; 6 1/4 yards of 3/8 worsted lace; 7 skeins of dark blue linen thread, No. 40. For musicians, add 5 yards of lace, and 2 skeins of thread. 3. Wheeler, George T., Military Collector and Historian, Question and Answer, Vol. XXXIV, (Winter 1982), p188, Washington D.C.
4.This is an e-mail from Fred Gaede date 5/21/01: Although Lee was a contractor from October 1861 to the end of 1863,** He didn't make too many uniform jackets. ( There are a number of contracts for a Joseph Lea, also of NY City.) For mounted services jackets in general he was paid for "making and trimming" in Nov 1861, and between July and Sept 1862. These were of Gov't supplied material and trim, open-ended contracts so no numbers given. He delivered 5,000 artillery uniform jackets to the NY Depot in November 1863, and 7,--- September 1863 10,000 November 1863 and 5,000 December 1863, all to NY Depot. One contracts for Cavalry Musicians jackets, 2,000 to NY February 1863.